Posted December 29, 2016 by Bence. Everybody seems ready to go ! Today was officially the second day of the contest, but actually it was the first day when the strange rally cars have actually started one of the most unique races in the world. And they didn’t start bad at all! Every single one of the strange rally cars have made it to the next stop, which is the city of Pondicherry – they started from Chennai. That means that all the 20 teams and all the 46 competitors are waiting for the next day and the next challenges in this whole new experience of the Rickshaw Challenge. Of course as in any other important sports events, our Rickshaw Challenge couldn’t have started just without an opening ceremony. Before the strange rally cars took off to race each other, the racers met each other for a lunch break. After lunch, they were lead to the testing grounds of the Tamilnadu Institute of RoadTransport where they actually met their weird race cars. The racers really liked the artwork of the helpers at Chennai Garage, however, some of them chose to personalize their strange rally cars by painting on them. After the strange racing cars were shown to them, they were also given a lecture about how to drive them safely, and the whole occasion ended with Aravind and Princely of the Travel Scientists demonstrating what these strange rally cars can do. Of course it would have been kind of stupid to let the racers kick off and start racing right after they met their strange rally cars. They had to practice how to drive and how to restart the engines and basic stuff like that. The tutorial was quite useful since some of the drivers came without any motor riding experience, so even whirring up the engine was not that easy in the beginning. 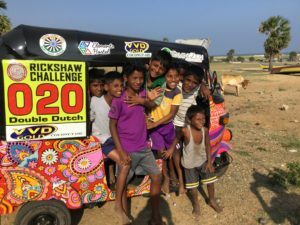 The Rickshaw Challenge participants turned out to be great students – they quickly learnt how to drive the weird racing cars and what’s even more important, they were all having a great time while learning to do so! The whole process went on without any problems, except for a group of Indian driving students, who just accidentally bumped into the Rickshaw Challenge lessons. However, they also ended up enjoying the spectacle, so it was alright. After all this, the testers were given one last task before one of the most unique races in the world has started: fill their tanks and ride back to Deccan Plaza hotel, from where it all begins. Luckily they all made it back without any serious difficulties, which is quite an achievement since some of them just learnt how to even start the vehicle. And let the show begin! The weird racing event had actually started on Thursday morning when all the strange rally cars went towards south from Chennai. The most important goal was to reach the city of Pondicherry and all competitors managed to ace that goal on time, despite the fact that one of the teams had to change the engine. Luckily the helpers of Chennai Garage were there to help and all they needed was around half an hour, which is quite an impressive time to fix a problem of that level. They solved it in no time so all teams managed to continue their adventure to the assigned destination. Some even scored some extra points by visiting a 17th-century fortress, Sadras, the ruins of Fort Alambarai as well as a random petrol station in Kalapettai. As you can see, the racers aren’t lacking fun or adventure on their way. A lot has happened to them and it’s still only just the end of the first day. A lot more is yet to come. Tomorrow, they are going on towards Thanjavur, and the unique racers are sure to face tons of difficulties and adventures in the next few days till the end of the Rickshaw Race in India. Stay tuned by following all their adventures on our site! Day 3 of the 2017 Baltic Run is Here! Day 2 of the Best Car Rally in Europe Finally Gets Going!